Summary: With modern basketball shifting towards a positionless game, this offense provides multi-talented players the chance to operate in space and create easy shots for themselves or for teammates. This offense creates highly efficient shots and is tough to defend with typical man to man principles. Why should you use this offenase? You have five players of similar size and ability, but no true ‘big man’ in the group. You have a couple players that are great shooters but cannot create their own shot. You have guards than operate well out of a side pick and roll. You have unselfish players that do not care who scores. You face aggressive man to man defenses that deny passes and extend ball pressure. You believe in an ‘equal opportunity’ offense where one player does not dominate the ball. You want to create great spacing and occupy help defenders with weak side action. You will get efficient shots either around the rim or open threes. Works as both a quick hitter or a continuity ball-control offense. What are some challenges when implementing this offense? Your best players won’t necessarily be getting the majority of shots. Many schools, especially small ones, do not have five guys with the broad skill set needed. Since all players may touch the ball in any position, they must learn great shot selection. Players might need to be patient in reading screens and making the correct pass to beat defense. This offense involves two offensive actions over and over again so it is important that you practice them with your players. Those to actions are the dribble handoff/pitch as well as an elevator screen. Put your players in as many shooting or breakdown drills as you can so they can shoot in these situations as well as make good decisions if the shot is not there. All players need to know all spots. Primary Ball Handler (1): Even though this offense flows into a positionless continuity offense, your point guard will still be your primary ball handler and will decide which side of the floor the offense will start on. If you have a weaker point guard here, that is actually okay. He won’t be the first option to shoot unless there is a defensive breakdown. As usual, if he can knock down threes, that is helpful. Shooting Guards (2&3): Need to be able to catch and shoot coming off of a screen. The 2 is usually the better of the two shooters as he will likely have the first opportunity at an open jump shot. 3 should be the stronger of the two as their first touch will likely be in a ball screen or handoff situation. The more range they have, the better. Secondly, they must be able to catch the ball on the move either from a ball screen or dribble handoff and then they must make good decisions coming out of that situation. If they are not a great shooter they can still survive in this offense if they are aggressive and make smart decisions when they drive. Most of their drives will actually result in open shots for their teammates rather than themselves, so being selfish is a huge pitfall here. Create for your teammates. Forward (4) / Center (5): These two guys must have the ability to set great screens and the smarts to know what their own ball handling and shot capabilities are. If they are smaller and can handle the ball a bit better than those at their position, that is actually a plus. If they can shoot even a little bit, this offense becomes very hard to defend. They may be left open for shots that are out of their range so teaching them what is a good shot and what isn’t is very important. Of course that is important for players in just about all offenses, but especially here. This offense should yield plenty of catch and shoot chances. According to the NBA’s SportVu Player Tracking statistics, players have an effective field goal percentage of over 51% when they catch and shoot. That number drops to 40% off the dribble. If the most skilled players in the world drop off 11% on the dribble, you could assume players at your level drop off even more. We start this set in a five out formation. Players can be in any spot to start as all positions are interchangeable. Ideally though we like our best player/shooter to occupy the spot 2 is in below. He will be the first player to get a chance to score a layup and if we screen well will likely have an open jump shot on a weak side ball reversal. Play starts with a dribble at either wing. That wing makes a rim cut looking for a backdoor layup. We don’t score on this look often but if the defense is lazy you must take advantage. This is where you can take advantage of teams that play an aggressive man to man defense. Use it against them. Obviously this is a less likely option against more Packline style defenses. If we cannot score the backdoor layup, The point guard and the guard in the corner will run a dribble handoff. The more speed they can exchange the ball with, the better. We have already put the defense at a disadvantage if we do this. At this point 4 and 5 have already set up for an elevator screen for 2. Some teams like to run this with a staggered screen which certainly has its merits, but our team found better looks and set better screens when we went to this look. If we have proper spacing 3 should be able to turn the corner and look to attack the rim. The weakside screening and movement should pull help defenders out of position. So the player getting the dribble handoff must turn the corner hard and be looking to score first. This goes for any player catching the ball after a screen or handoff. Your first thought needs to be: Can I score easily? 3 has several options if the drive is cut off. The most likely one is an open three from 2 who has come up through the elevator screen. Another look we often get is a corner three from 1 because the defense worked too hard to protect against the drive on the original dribble handoff. Making the right decision here leaves the defense in a tough position. You must stress to 1 though that if he catches, it must be into an open jump shot immediately. Holding the ball in this offense completely throws it off. There is no room for hesitation. If 2 is a great shooter, you may get this option more often than not. If the defense over reacts to the elevator screen, 4 simply dives to the rim for a pass from 3. He’ll either be wide open or sometimes he will have a smaller defender on his back because of a switch in the defense. For the sake of demonstration, let’s say we get the ball to 2 and he cannot get a shot off, the lower of the two screeners sets a screen to free up his fellow screener to the corner. (4 and 5 shown here). Again, don’t ignore the screener here. Often times, 5 can slip and dive to the rim for an easy catch and score. This usually happens if we have run through this offense a few times and the defense predicts we are just going to throw to the corner like robots. Now we enter the continuity piece to the offense. 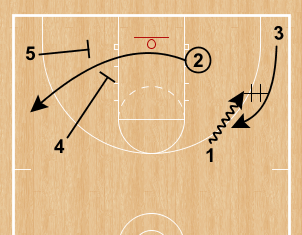 Whether it is a dribble handoff, dribble pitch, or a straight ball screen, if the player in the corner cannot shoot an immediate open three, we run right into side ball screen action, with your last screener cutting away and your weak side players setting up an elevator screen again. It is imperative the ball not stay stuck in the corner or even stuck on one side of the court. The defense has already shifted right to left once. If you can get them to shift again, your shot will likely be an open one. Don’t let them rest by being stagnant. It is key to note here that your 5 man is making this cut and he very well may not be a great shooter. It is imperative that you either a) work on him improving his shooting range or b) express that he is catching and should be immediately looking to dribble handoff or ball screen to the guard in the corner. Here you see we have the same set up as the original offense with 4 having the option get to the rim, pitch to a corner, pass to 5 or find 3 on diving to the rim. To learn more about using dribble handoffs in your offense, take a look at this youtube video. It does not depict the offense shown above, however it does demonstrate how effective a good DHO can be. Closing thoughts from Coach Ben Murphy: I think this is a great modern offense because it forces defenses to react a lot of movement, screening and most importantly three point shooting. It has great spacing too. As ‘small ball’ becomes more popular, this offense could work even better, with potentially five three point shooters on the court at any one time.